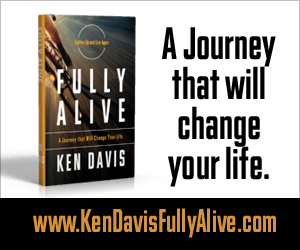 But the main reason this one is special is because I have seen the transformation in Ken as he has lived out the message in his new book – Fully Alive: The Journey That Will Change Your Life. Ken’s life has been truly changed – physically, emotionally, relationally, and spiritually. There is so much that has been written about each of those aspects…individually. One tells you how to get in shape. Another guides you through living in the present instead of being controlled by the past. Still another will help you deepen relationships. And yet another explores restoring vibrancy to your relationship with your Creator. I don’t know that I have ever read a book that so masterfully weaves them all together. Oh…and it’s funny. Ken can’t NOT be funny. But it’s not just funny. It is so much more! The transparency Ken writes with in Fully Alive is truly rare. Many times my eyes were blurred as the tears welled up. Yet I never felt like Ken was telling one of these stories to simply draw a reaction. Every story – funny, sad, exuberant, or gut-wrenching – were put there to challenge, encourage, and guide his readers to the life they could live. The life they should live. The life they were made to live. There is no such thing as a small choice. The choices you make today affect your tomorrow. Those tiny little choices become habits that eventually destroy the foundations of your life or lead you toward living fully alive. From cover to cover, Ken inspired me and equipped me to make those choices. Every time I am around Ken or talk with him I am inspired by his life.Today I sit inspired by his words. And I am more honored than ever to call him my friend. Please grab a copy. And prepare yourself to live…Fully Alive! Disclosure: Some of the links in this post are affiliate links. (Simply means I’ll get a small fee if you click it and purchase the book.) That said, I never recommend a book or product I don’t fully endorse.